Sebastopol is a suburb of Ballarat, about 4 km south-west of the city centre. Much of the suburb is situated on a plateau in which mining began in 1854 after the easier alluvial gold had been taken from the Ballarat gold fields during the previous three years. Several tent camps were established and the miners named the place after the Crimean War siege location, Sebastopol, (October 1854 - September 1855). Another locality, partly included in Sebastopol, was named Redan, also a place in Crimea. Many of the miners were Welsh or Cornish. There were Sebastopol and Cambrian Hill Welsh Choirs which competed at a Ballarat Eisteddfod in 1858, a forerunner of the Royal South Street competitions. A Welsh chapel was opened in 1858, and in 1861 the Welsh Presbyterian and the Zion Congregational churches were opened. Sebastopol had an estimated population of 20,000 people. The district’s first school (1857) was some distance south in Magpie Gully, but in 1861 an Anglican school was opened in Sebastopol. A mechanics’ institute was built in 1864, and the Welsh/Methodist influence was further enlarged with a Wesleyan church. 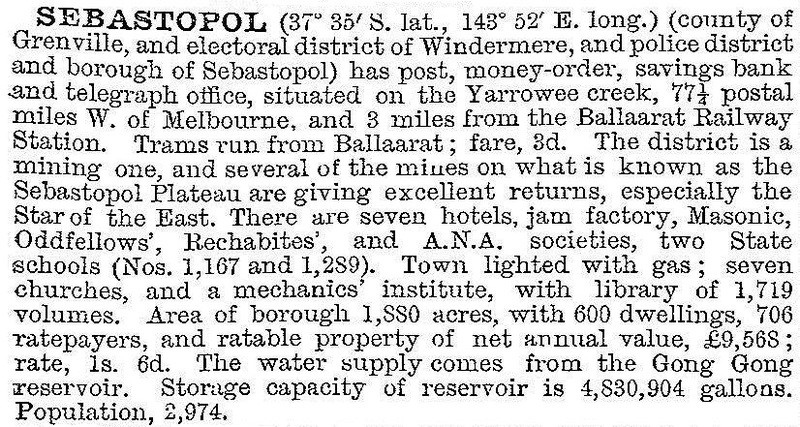 On 1 November 1864, Sebastopol was proclaimed a borough. By then, however mining settled down to processing material from deep leads. Despite the influence of Methodism, Sebastopol and Magpie Gully had upwards of ninety hotels licensed during 1856-70, but not all at the one time. Until 1873 there were several private schools, which were substantially absorbed by the government schools opened at Redan (1874) and Sebastopol (1873). At about this time many of the gold claims approached exhaustion, and Sebastopol’s population fell by 62% during 1871-81. Gold production actually ceased during 1883-85, but new shafts sunk in 1886 renewed production. The best days were past however, and local option polls closed several hotels in 1892. 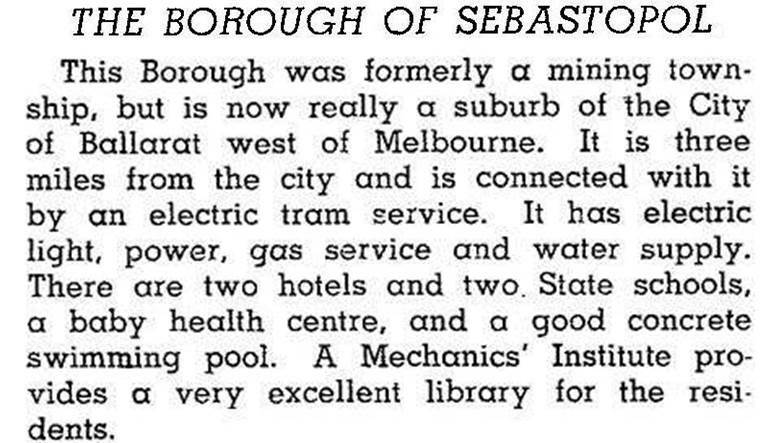 Sebastopol’s sense of separateness was debated in 1893 when a horse tram service connected it to Ballarat, and electrification of the line in 1913 probably ended any such notion. Between 1947 and 1961 the population more than doubled to about 4700. Steady growth brought the figure to 7500 in 1991. A Catholic primary school was opened in 1956 and a coeducational technical school was opened in 1962. Sebastopol’s main street is Albert Street/Midland Highway, where there are the former borough offices, the main churches (including the Zion and Wesleyan churches which combined as the Uniting) and the shops. There are also two public reserves, the larger one with ovals and a velodrome, a bowling club, a swimming pool and an equestrian centre. A community centre was opened in the old Sebastopol school building in 1979, and there are two community health centres. Two hotels continue, both in Albert Street. Sebastopol primary school had 112 pupils in 2014. Sebastopol’s eastern boundary is the Yarrawee River where there is a linear park with a walking trail. There are also two wetlands, Redan and Yuille’s. Near the latter there is also Yuille’s Station park, named after William Yuille who took up the pastoral run named Ballarat in 1838.